Following four successful years of touring and more than 350 performances, the “most famous reindeer of all” from the longest-running and highest-rated holiday television special will fly into Sarasota at the Van Wezel Performing Arts Hall on Saturday, December 22 at 6:30 p.m. live on stage with the critically acclaimed Rudolph the Red-Nosed Reindeer: The Musical. The world’s most famous reindeer and a holly jolly cast of iconic characters including Hermey the Elf, Yukon Cornelius and the Abominable Snow Monster will help Santa save Christmas! Tickets are $32-$67 with only select sections remaining. Purchase at VanWezel.org, the Box Office or by calling 941-953-3368. Groups of 10 or more should contact (941) 363-2025. In 1964, the beloved stop-motion animated television classic, Rudolph the Red-Nosed Reindeer, made its network television debut and has been delighting audiences across the country for over 50 years. 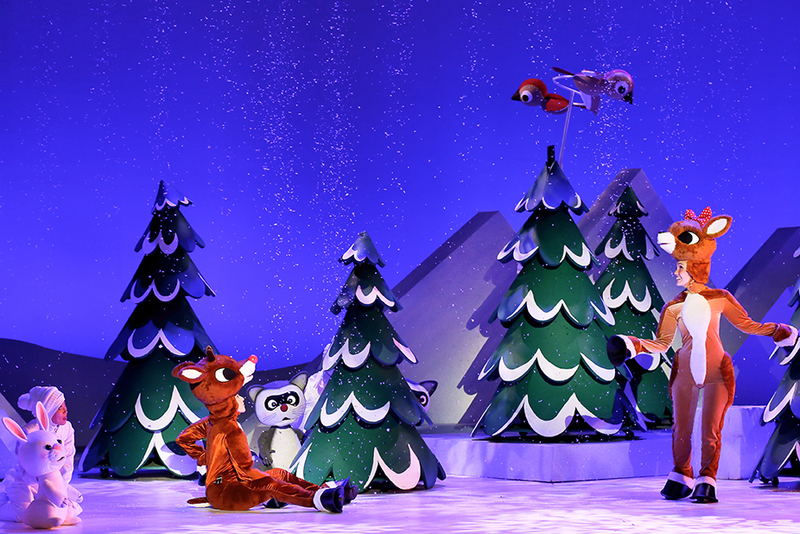 “Rudolph the Red-Nosed Reindeer: The Musical is a wonderful new way to experience this family tradition,” says producing partner, Jonathan Flom. The national tour is a family favorite — a “holiday staple” (The Boston Globe) and an “utterly charming, top-notch production” (Orlando Sentinel). Projections, costumes and characters are faithfully brought to the stage against a backdrop of nostalgic set designs. The 12-foot-plus-tall Abominable Snow Monster is jaw-dropping. The cast brings high energy to classic songs and dialogue, while irresistible and loveable puppets highlight the charming “roughness” from the television show’s stop-motion effects. Flom says, “The familiar story elements from the television special are addressed with a talented cast and puppeteers who help recreate the magic on stage.” Since the special itself is a classic musical, the stage show does not feel at all like an adaptation and audiences are surprised and delighted when they see performances of songs such as “Fame and Fortune” and “Rockin’ Around the Christmas Tree” that are heard but not performed in the TV special. The story tells the tale of a young Rudolph who, because of the appearance of his bright, shining nose, is excluded from the Reindeer Games. He flees Christmastown and meets up with new friends Hermey the Elf and Yukon Cornelius. After finding The Island of Misfit Toys, Rudolph journeys home, where a snowstorm of epic proportions is threatening Christmas. Can Rudolph rescue his family and friends and help Santa save the holiday? Rudolph’s partnership with PACER’s National Bullying Prevention Center continues this year. The show offers a free toolkit to teachers that leverages the powerful messages from the Rudolph story to teach important character values. In addition, a portion of proceeds from venue sales of the book, T.E.A.M. Rudolph and the Reindeer Games, will be donated to PACER. For more information, visit www.rudolphthemusical.com and follow the latest updates to the Facebook page at facebook.com/rudolphthemusicaltour. Rudolph the Red-Nosed Reindeer: The Musical is produced by Right Angle Entertainment, S2BN Entertainment and Premiere Producers LLC. Right Angle Entertainment (Producers): Founded in 2014 by Alison Spiriti and Justin Sudds, Right Angle Entertainment specializes in the creation, production and management of live touring shows with a focus on bringing personalities and brands to life on stage. The shows cross genres from concerts to digital stars to theatrical productions. Tickets are $32-$67 with only select sections remaining. Purchase at VanWezel.org, the Box Office or by calling 941-953-3368. Groups of 10 or more should contact (941) 363-2025. This performance is part of the Boars Head Family Series.